Origin and Habitat: South Africa, Eastern Cape, Western Cape (Montagu to Uniondale, Matjiesfontein to Laingsburg and Gamka Poort, and Klaarstroom). Extent of occurence 15 700 km², known from 13 locations. This taxon is very rare and difficult to find. Alttude range: Grows in arid areas of at around 300-900 m of altitude. Habitat and ecology: This species grows on steep shale slopes or near the foot of sandstone mountains, usually on hotter, northern aspects, occasional it is found on flat areas and cooler, southern slopes. Pollination is done mainly by flies. This unusual pollination biology is referred to as myophily (pollination by flies). Myophily takes place in some of the following genera, Stapelia, Huernia and Ceropegia. Life for a young Hoodia plant begins under the protection of a nurse plant. A nurse plant is a shrub under which the young plant germinates and grows, protected by its leaves and branches from the suns strong rays. Low densities are most likely the result of habitat degradation due to overgrazing throughout its range as well as harvesting for food by local people. Trichocaulon pillansii var. major N.E.Br. 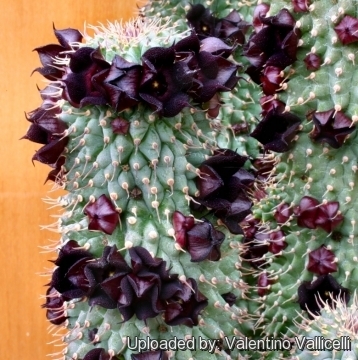 Description: Hoodia pilifera is a Leafless fat-stemmed succulent 50-80 cm in height, with fleshy, ribbed and thorny stems arising from a common base. It will form large group up to 2 m in diameter (but usually much smaller). The variety name ''pilifera'' means having flexible hair-like spines (from Latin ''pilus'' hair). This species appears to be quite variable regarding the colour of flowers and the shape of stems in different populations. Stem: Stricltly cylindrical up to 80 cm tall, 3-6 cm in diameter, dark green to pale grey green (sometime with a purple hue). The knobbly surface helps to scatter the sun's radiation, minimising the amount of heat they absorb. Ribs: 21-34 with laterally flattened tubercles each of them with a grey or brownish apical flexible bristle like spine 3-9 mm long. Flowers: Saucer-shaped/campanulate, inside dark purple to almost black or pinkish brown, outside reddish green, with a smell of decaying flesh to attract flies and blowflies (the main pollinators). The flowers are solitary or in small inflorescences with up to 3 frowers. Pedicel 0.5-1.5 mm long. Blooming season: Flowers are normally borne in August or September. 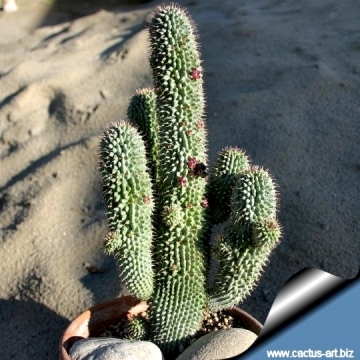 Hoodia takes duration of 5 years to be completely mature, till its flowers appear. Fruits: The seed capsules resemble the horns of a goat and contain numerous seeds. Seeds: The seeds are light brown in colour, are flat and have a pappus of fluffy, silky hair attached to their one end. This pappus acts as a parachute when the seed pod splits open. The seeds are blown some distance from the parent plant where they will establish themselves. Hoodia pilifera (L.f.) Plowes: (subsp. 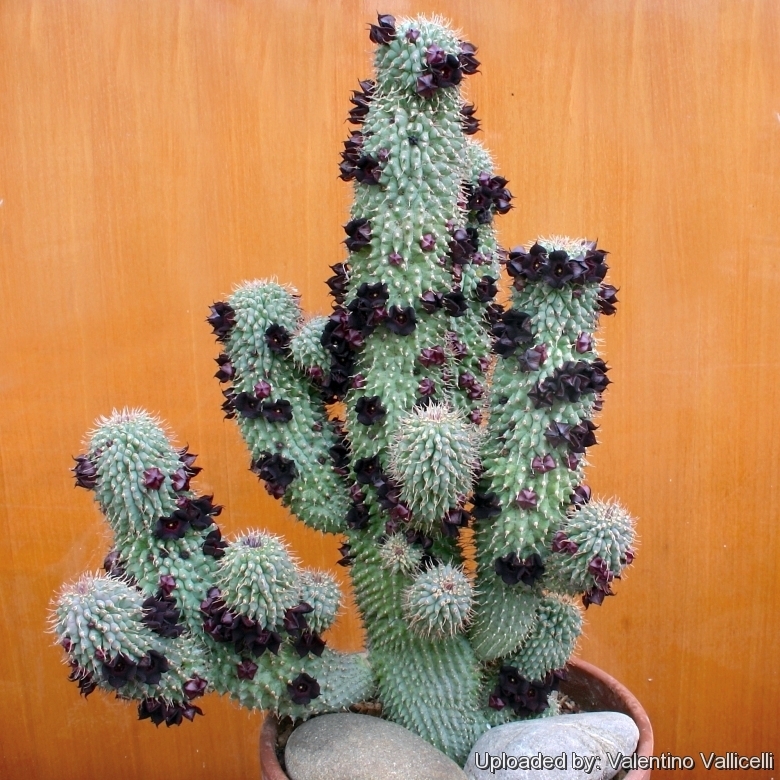 pilifera) flowers purple-brown almost black and without a ring (annulus), up to 20 mm in diameter. Distribution: Eastern Cape, Western Cape. 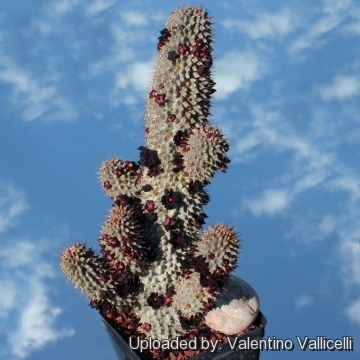 Hoodia pilifera subs. annulata (N.E.Br.) Bruyns: flowers dark purple to black, 20-30 mm in diameter, with spreading lobes. Hoodia pilifera subs. pillansii (N.E.Br.) Bruyns: flowers yellow to pinkish, without the raised rim (annulus) as in the other subspecies. 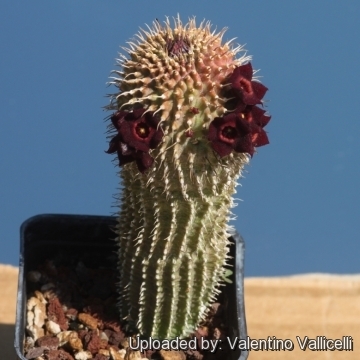 Notes: The Systematics in Hoodia are, like in almost any other plant group, always fully unfinished and open to discussion among the different authors. There are many difficulty in Hoodia identification. If we have some plants from unidentified origin ( plants provided unlabeled or with poor identification data), we have to wait until the plant is in flower and also specialists and growers have quite a difficulty to identify correctly this plants. 3) Bruyns, P,V. 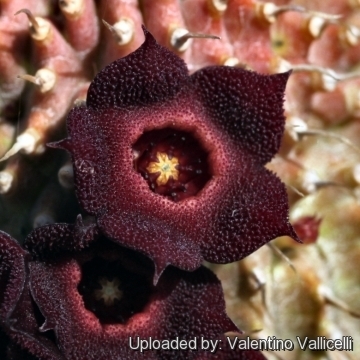 “Stapeliads of Southern Africa and Madagascar.” Umdaus Press, Hatfield, South Africa. 2005. 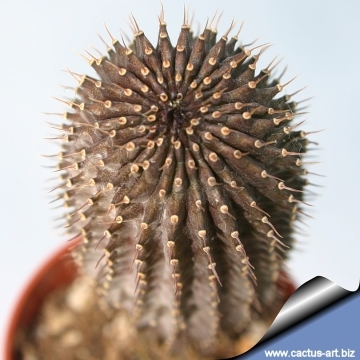 Cultivation and Propagation: Hoodia pilifera is one of easiest species to grow but prone to root rot due to overwaterings and lack of fresh air. Water normally in the growing season, sparsely in the winter. It is usually recommended to over-winter them in warm conditions (at 10° C), but despite their African origins they seem to grow well and flower without the extra heat which one might have thought necessary, and occasional temperatures near 0°C (or less) are tolerated, if kept dry. Spring: In the spring leaving them out in the rain may provide them with the water they need. Summer: In the summer months they will grow well in full sun or partial shade and tolerate heavy rain, but will be just as happy if the season is dry. Uses: In its native country of South Africa it is referred to by the indigenous people Khoi-San herders as “ghaap”, “guaap”, “or ngaap” were they use it as a convenient emergency food and moisture source in harsh arid environments. 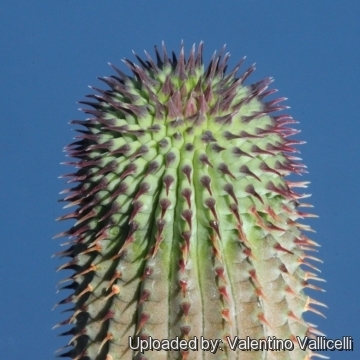 Hoodia pilifera has an insipid, yet cool and watery taste. The plant is edible in its raw state or preserved in sugar. The young pod are liked for their sweetnees. 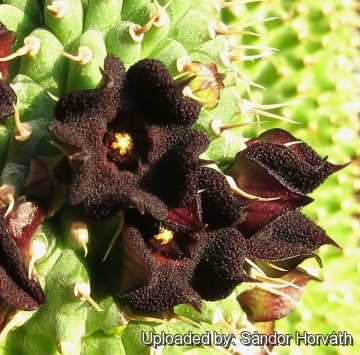 Similarly to Hoodia gordoni and several other succulents known as carrion flowers or stapeliads this species can be used as an appetite and thirst suppressant. A small piece of the stem is peeled to remove the thorns and is eaten fresh. The optimal dose is not yet known. Propagation: Propagation is done mainly from seed. Cuttings are not really an option, as the severed ends very rarely form a callus from where roots will eventually form. Seeds are produced in March and April of each year (Europe). The seed horns must be semi-dry and starting to split down the middle before seed can be collected. If you try to take a cutting allows it to dry several days before planting.